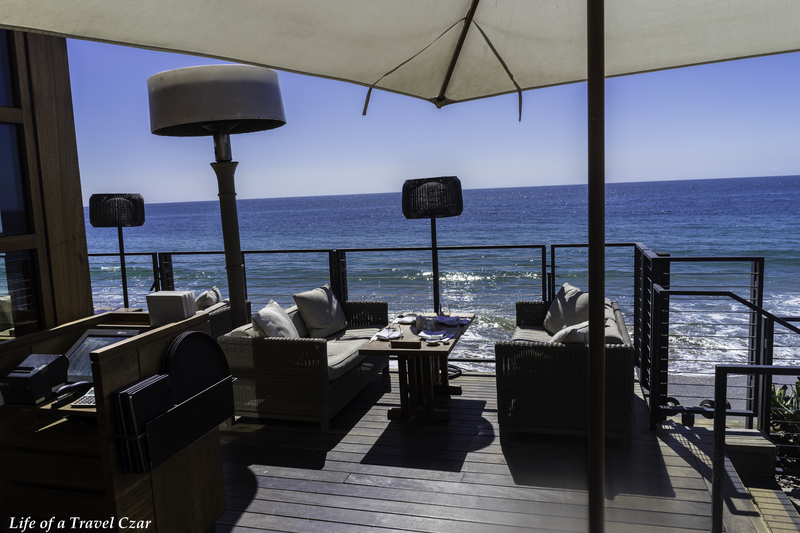 So I was discussing my trip to LA with a dear friend and she opined that I must pay a visit to Nobu in Malibu. 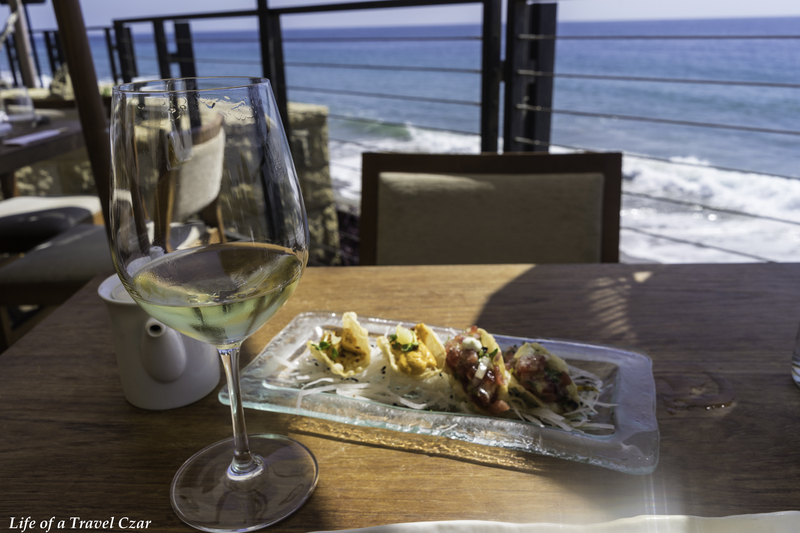 She noted that doing an afternoon at Nobu in Malibu is such an “Travel Czar thing” to do. I quickly perused some background materials on Nobu (Malibu) and of course reflected on my personal experiences in the Melbourne and Perth establishments and decided it was certainly worth the visit. I arrive after a lovely trip across the Pacific Coast Highway past the beautiful beaches that line the Californian coast. 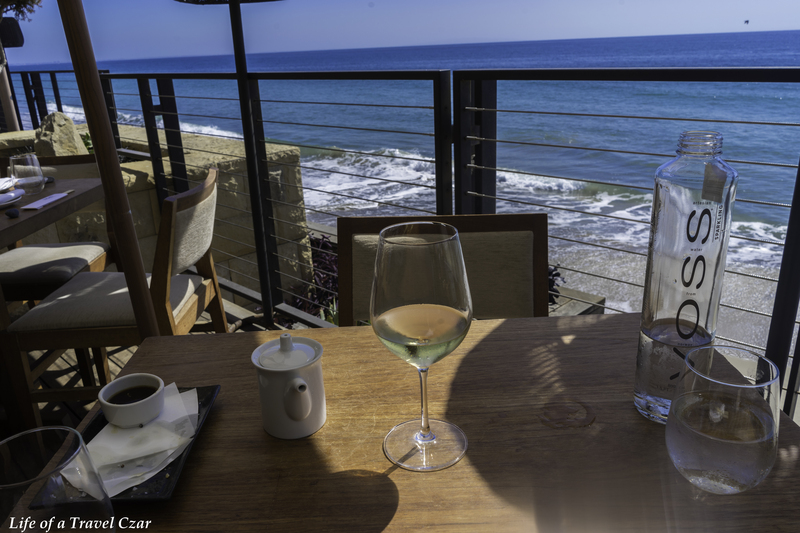 I find myself outside the lovely wooden facade of Nobu and the gorgeous expansive never-ending Pacific Ocean which has the infinite depths of blue all the way to the horizon and meets the sandy shores of Malibu with its foamy waves. I could live here! 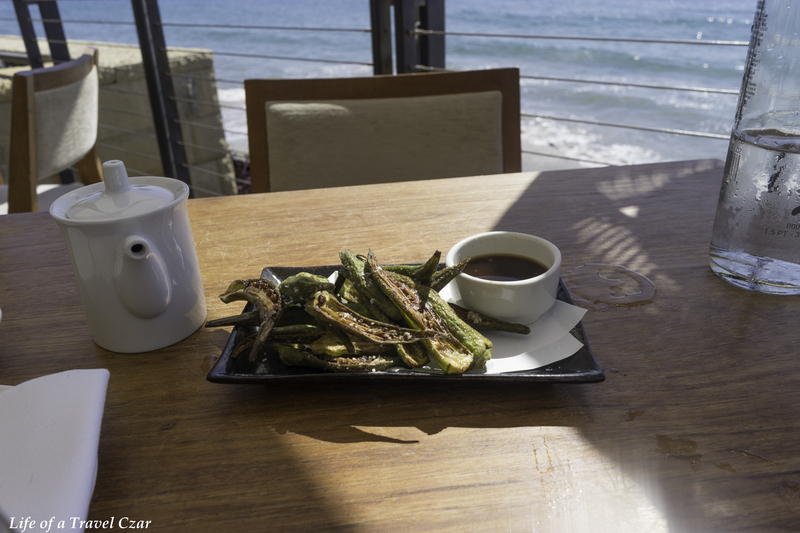 I arrive and am seated in a wonderful table right next to the shores on Malibu Beach. 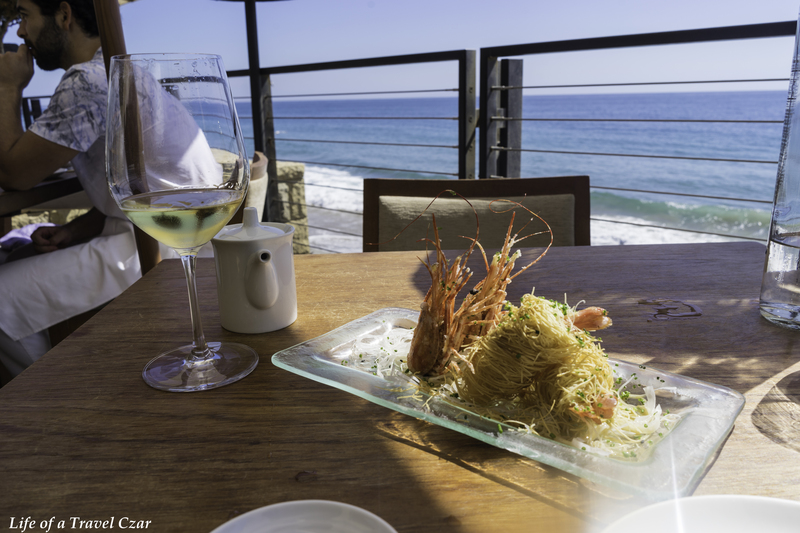 The waves crash on the shores below the deck and form the perfect background tune the lunch. Here is a little video of the entrance and my table (the background tune I have used is Young & Beautiful from Lana Del Rey – I don’t own the rights to the song).. I have to settle on a wine for the afternoon. A careful examination of the wine list and lunch menu leads me to choose a Meursault as the dance partner to the cuisine today. The acidity and creaminess would be a gem with the seafood dishes. 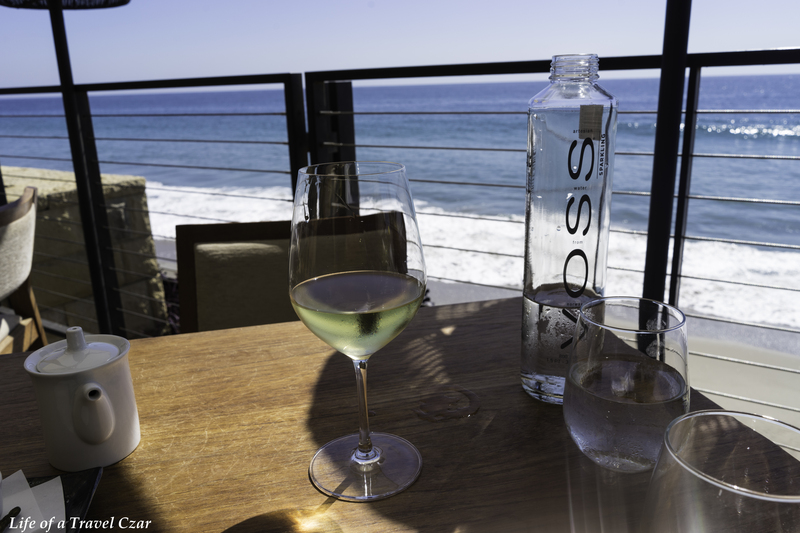 It’s a warm day in Malibu and the wine proves particularly refreshing. On the nose there is a beautiful lime and citrus notes with hints of light spice (cloves and nutmeg). On the palate the wine has a gorgeous creamy texture with beautiful flavours of apple and lemon which dominate and drive the crisp acidity and mouthwatering minerality. In the finish there is a little saline iodine oyster shell note which strikes the perfect balance with the acidity and worked harmoniously with some of the key dishes of the afternoon. As I go through the menu, I order some crispy okra to work through the decision process. These are lovely. The waiter returns and we have a solid discussion about the menu. His knowledge of the produce and the culinary process is second to none. In fact incredibly impressive. We agree to go “off-piste” to use a ski term and select some quality dishes which are actually not on the menu. As we work through we appropriately tailor the right menu for the afternoon and it turns out to be a symphony. This dish is not on the menu. It is an Akami (back part) cut of the tuna and is mixed with traditional Nobu seasoning of citrus and jalapeno. The dish is a triangulation of flavours which mix to form the perfect taste experience. 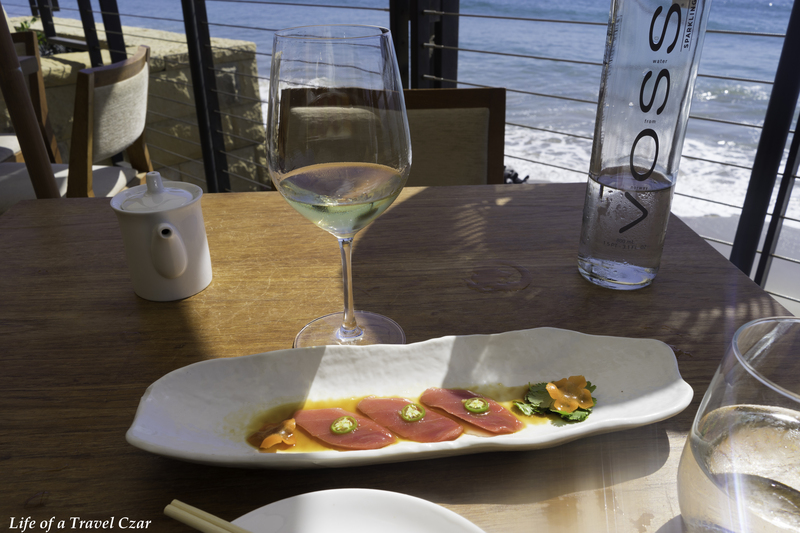 The bite of citrus and jalapeno are a wonderful infusion to the ‎beautiful fatty blue-fin tuna which melds perfectly into the lemon & acidity of Meursault. The three intertwine to deliver the most amazing taste experience. 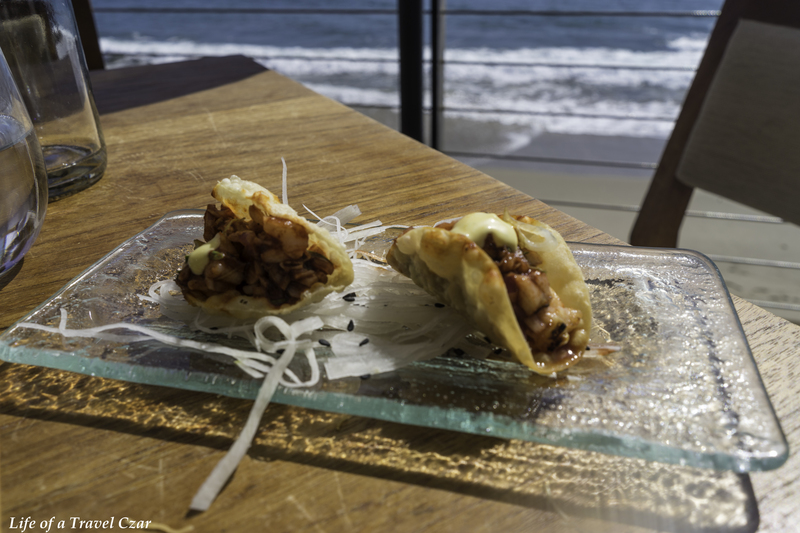 The tacos offer a beautiful array textural differences and mix of flavours. The bite of onion is noticeable in the tuna and balances it sweetness well. The taco shell is so crumbly and agreeable to the palate and works in wonderful contract to the soft jelly like texture of the tuna. 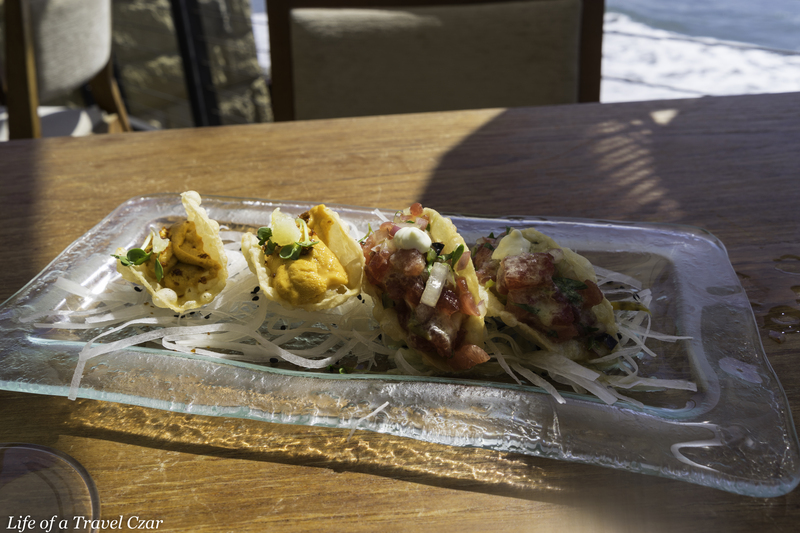 The sea urchin (uni) taco delivers the wonderful fresh sweetness of uni. It is indescribable and unique with a custard style texture and sweet taste with a little saline kiss in the finish. Again the crumbly taco shell which is a sensation in the mouth works in contrast to the uni’s texture to deliver a wonderful taste experience. Upon ordering the oysters, the host has taken the liberty to provide two seasonings for me to try. The oysters were creamy rich with the sweet saline streak as expected. The first seasoning was the Tiradito style. The beautiful flavours of citrus and yuzu provide good acid and spice to the fresh salinity of the oysters. The textural allure of the soft oysters on the tongue is truly an enchanting experience. The second is the Maui Onion – my favourite of the two. This particular oyster is beautiful sweet and creamy initially due to the oyster and the flavouring, however at the end the bite of the onion flows through to deliver a memorable punch to end the taste experience. 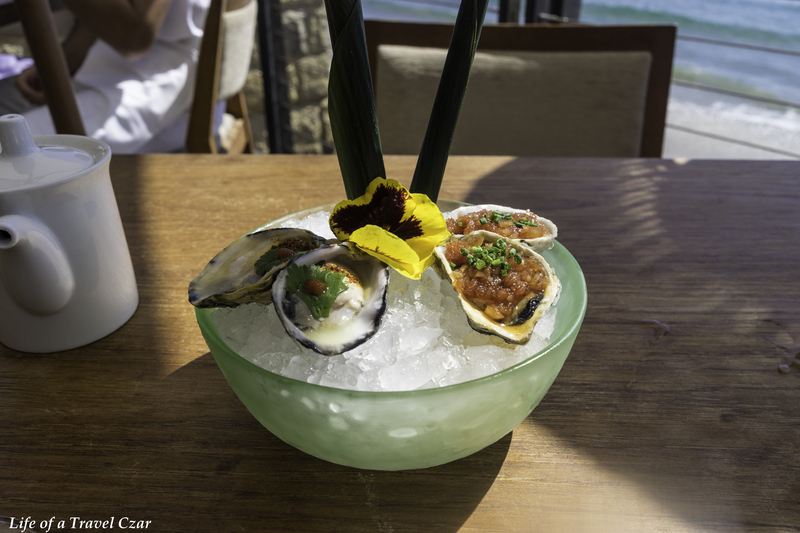 It is a mix of sweet, sour and sharp spice integrated into the salinity of the oyster. The crunchy textural detail of the Shrimp phyllo forms a exciting experience on the tongue. The fresh sweet shrimp meat is a delight with wonderful contrast to the phyllo pastry. The jalapeno base acid base continues the mix of rich seafood paired with acidic sauces which cut through very well. Its a mess and a treat to taste and a satisfying dish. The dish is well plated. The bite of wasabi and the kick of the pepper contrast with the pure saline sweetness of lobster. The wasabi cuts through well without overpowering the lobster. The crunch of the vegetables adds a lovely texture to the dish and is a beautiful base indeed and also benefits well from the wasabi kick in the dish. 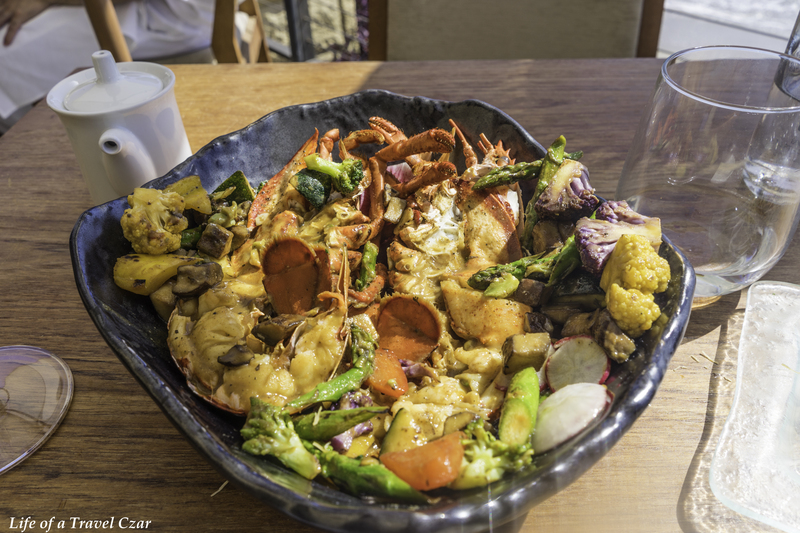 The lobster is the star of the dish and fires on all cylinders. The scallops have a sweet chilli style marinade. 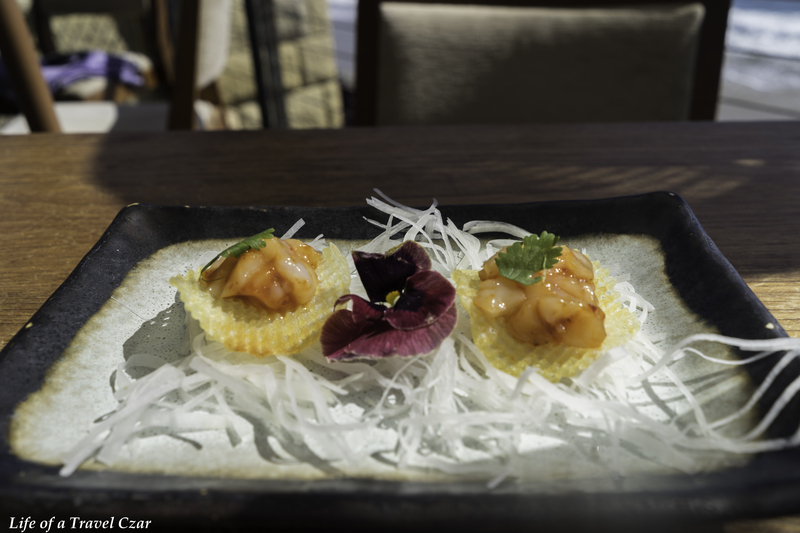 The succulent scallops are sweet on impact with and their beautiful natural flavours impress upon the palate with a bite at the end as the sweet chilli asserts its presence in the dish. The potato chip added a lovely crunchy finish (especially with the crinkle cut design) to the dish which mixed very well with the soft jelly-like texture of the scallop. The sushi is like a dynamite roll as they are commonly called in some sushi restaurants in Australia. The sweet rich fatty tuna meat, the vinegary rice, the salinity of the seaweed and the spice kick all interweave together in harmony. Its simplicity at its best with the tuna, rice and nori wrap working well together and the spice adding a little kicker in the finish. The juicy shrimps are delightful and still hold their natural flavours very well. The spice and smoke of chilli sauce flow effortlessly through the shrimp with the bite of Spanish onion in the finish. A rich little aioli dollop balances the flavour a little. As with the first set of tacos the crumbly taco shell which is a sensation in the mouth works in contrast to the uni’s texture to deliver a wonderful taste experience. I finish-off with an espresso to keep me awake on the ride home. 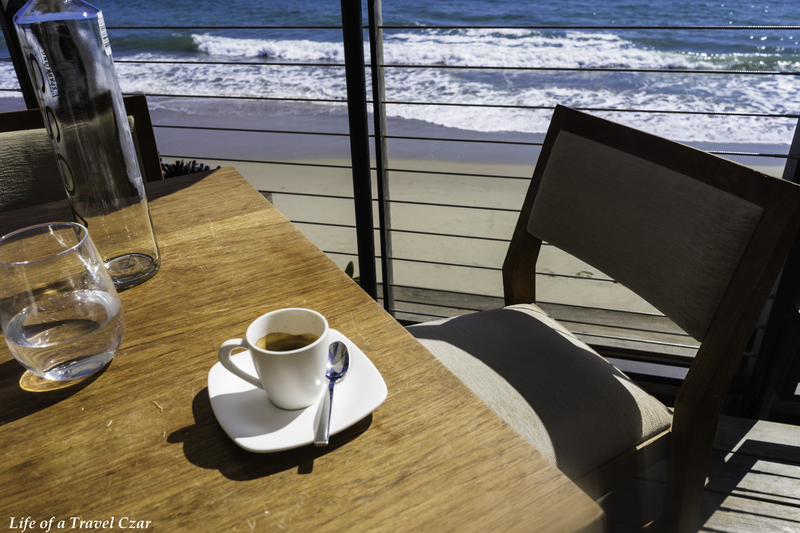 The caffeine hit is much needed and I gaze again at the deep blue Pacific Ocean as the sun casts a reflective glow across the surface of the water and say goodbye to Nobu. So what is the verdict on Nobu (Malibu). They say that one should only review restaurant blindfolded so the taste triumphs any disturbance of sight or other senses. I disagree, dining is a sensory exercise and one must apply all their faculties as such. I reflect on the vastness of the Pacific Ocean that makes one feel so insignificant as I walk out and it does dawn on me how insignificant and how distant we might be but how connected we are. The farmer/ fisherman, the chef / waiter and the designer of the venue often never meet, but they are connected… the key ingredient spends years under the care of the primary producer and travels miles away from its origin to a major city to endure the chef’s culinary processes to produce a dish. The dish then leaves the chef’s control and is handed to a waiter who must deliver it to the customer – their manner and tone are the first impression one has of the dish. The customer is seated at his table and for the majority of the dining experience, they immersed in the ambiance, the design and views of the restaurant… in fact it forms most of the experience. In Nobu (Malibu) the produce is perfect, the chef’s culinary skills are beyond question, the waiter has gone above expectations and the designer of the restaurant (albeit aided by God’s placement of the Pacific Ocean next to the restaurant) has produced a venue whose decor and style is without match. All seemingly disconnect people have worked independently over years to deliver a symphony of a dining experience. 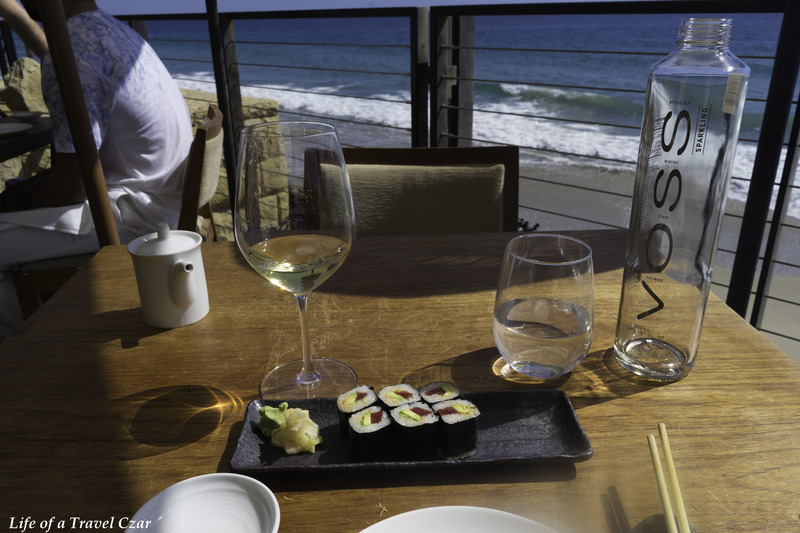 There is no question… here is my score for Nobu Malibu – 10 / 10. The perfect score. Did you need to request a table on the balcony when you booked? That view (along with the food) looks amazing!!!! What a treat!